I am so excited to be sharing BOXYCHARM again! With July being a Mermaid theme I was even more looking forward to it. 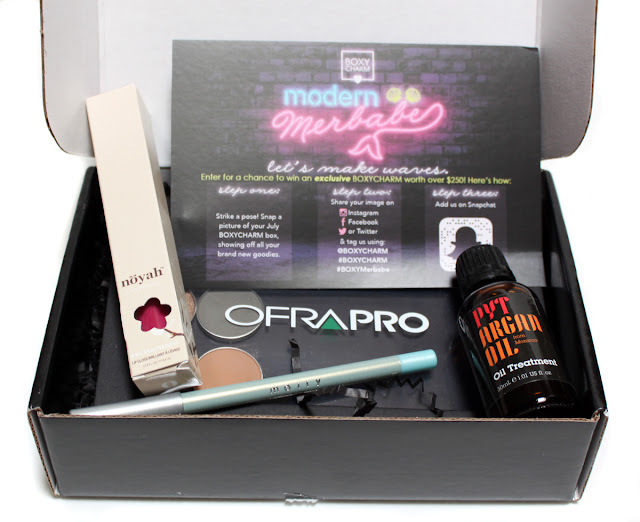 I took an extended break from subscription boxes but I am so happy to be back on board! If you are not familiar with BoxyCharm for $21 a month you get 5 Full Size products with a value of over $100. Free Shipping on all U.S. Orders. It's the best beauty box in the game. 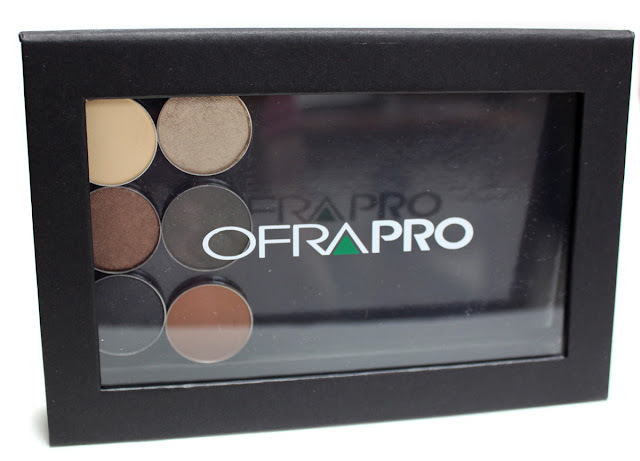 This professional magnetic palette made exclusively for BOXYCHARM comes equipped with a mix of six shimmer and matte eyeshadows that normally retail for $10 each pan. This six pan palette from OFRA makes this whole box worth it. Just like the liquid lipsticks the eyeshadow is fantastic quality too. 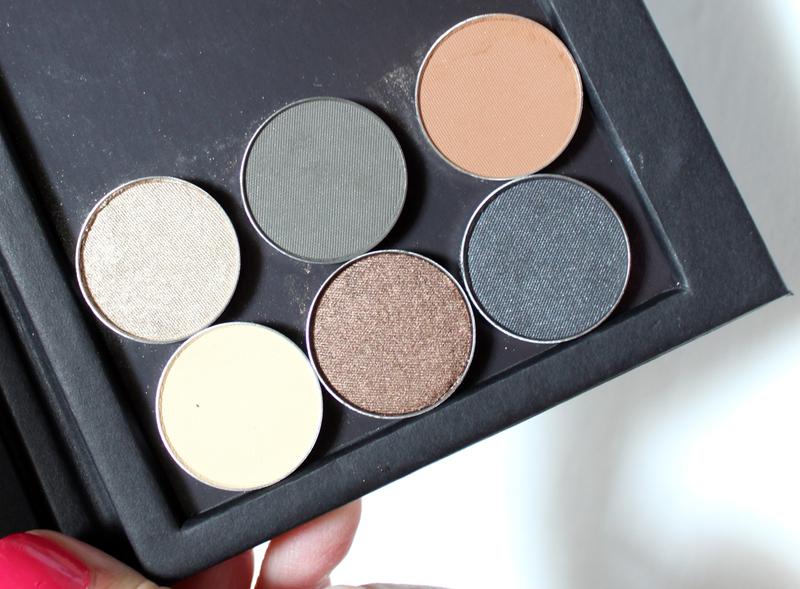 Buttery, pigmented, and I love that this set mimics a complete neutrals palette. 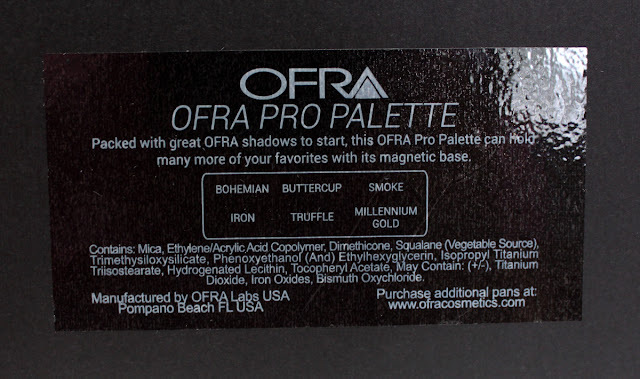 Getting a full size magnetic palette that you can fill with other pans is wonderful. The palette itself is so lightweight and thin that it will make it in to my travel bag all Summer for sure! This gorgeous sea foam blue-green is divine on the inner corner and rims of the eyes. It gives you that mermaid eye look without dousing yourself in garish blue or green eyeshadow. The eyeliner glides on easily without a shadow base, yet lasts all day. It is rich, creamy, and provides strong long-lasting coverage. This is my first time ever hearing of the NOYAH brand and I plan on checking out more from now. The packaging on this is gorgeous! The shade is a pretty cool toned medium pink that will look gorgeous with the neutral shadow's and mally liner. The gloss itself has excellent pigmentation and feels moisturizing and not sticky on. 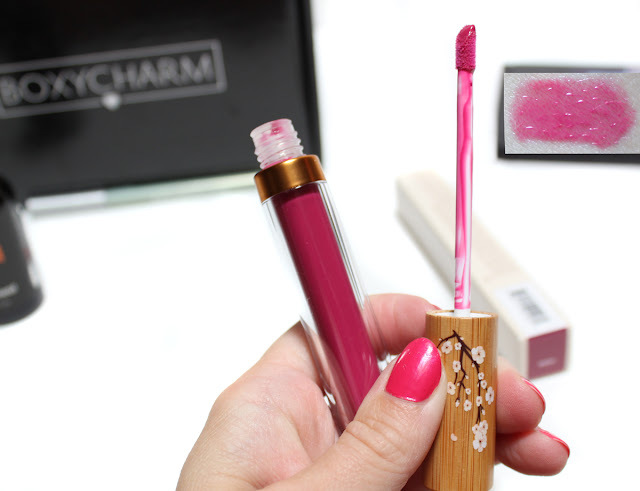 This natural lip gloss is made without sulfates, parabens, and with packaging made of composed earth-friendly bamboo. Sea-creature approved. There's nothing more hard on the hair than salt water, sun, and beach elements. 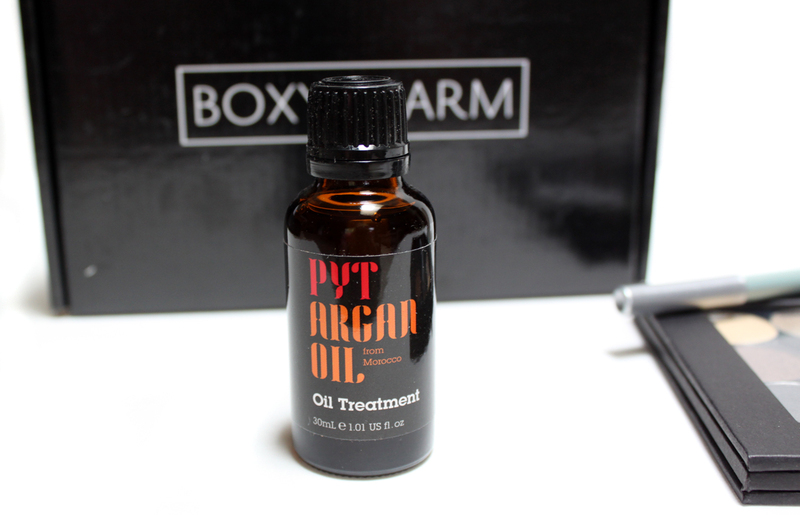 PYT hair oil penetrates the hair follicle and leave hair frizz-free. It prevents split ends and creates instant shine without oily residue. I have only tried this a couple times but I am a fan already. The oil isn't to heavy for my fine hair and rids it of frizz and dry ends. It also smells really nice too! BOXYCHARM is truly the best, most affordable beauty box out there. They really know how to stock a box full of quality products that fit a theme perfectly. I can't wait for next months! Summer is in full swing and that means we're ready to hit the beach! Just as important as taking along your SPF and waterproof mascara is the pre-travel routine to get your body beach ready. No diet or exercise required! Here is how I get glowing, smooth skin for Summer vacation! 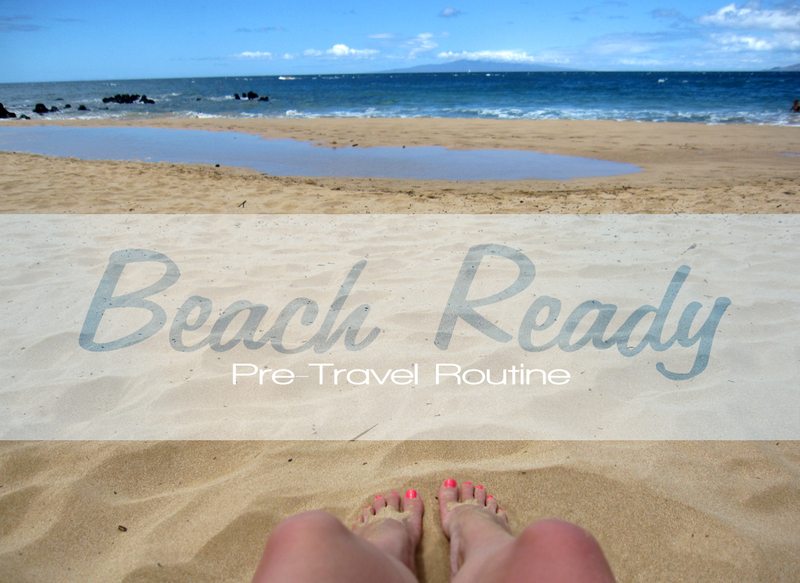 Keep Reading for my Beach Ready Routine with Sally Hansen! 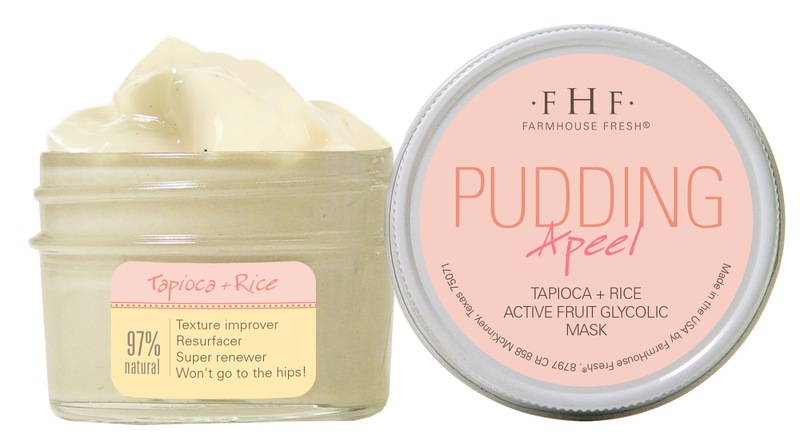 Practically a recipe for the perfect dessert, FarmHouse Fresh Pudding Apeel treats your skin to a delicious finish. Filled with Tapioca, brown rice, fruit extracts, green tea, honey, and coconut milk. This gentle resurfacing mask helps slough away dead surface cells, revealing newer, smooth textured skin over time. All of this, with no abrasion needed! After my success with the Splendid Dirt Nutrient Mask I was totally on board with FarmHouse Fresh's skincare. Pudding Apeel sounded like a mask made for Summer exfoliation when we don't need the big guns, it's even gentle enough to use daily. As we age, our cell turnover rate and natural exfoliation process slows down. Exfoliation removes dull-looking, old surface cells, and Pudding Apeel is designed to do just that! Glycolic and fruit extract Alpha Hydroxy Acids combine with hydrating honey and coconut milk to infuse skin with moisture as you renew. It's also 97% natural. 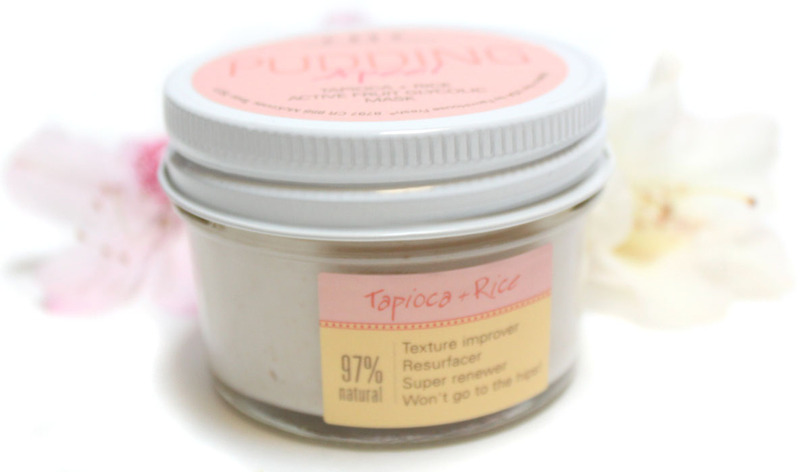 Tapioca provides a silky feel to skin. Plus, added green tea and honeysuckle extracts help soothe irritations. The exfoliation process also aids in the control of acne and helps improve the look of sun damaged and aging skin. Give this little guy a few days to work its pudding magic! This mask is gentle enough to use daily, but do not overlap its use with other exfoliation methods or products as it may be irritating to skin. 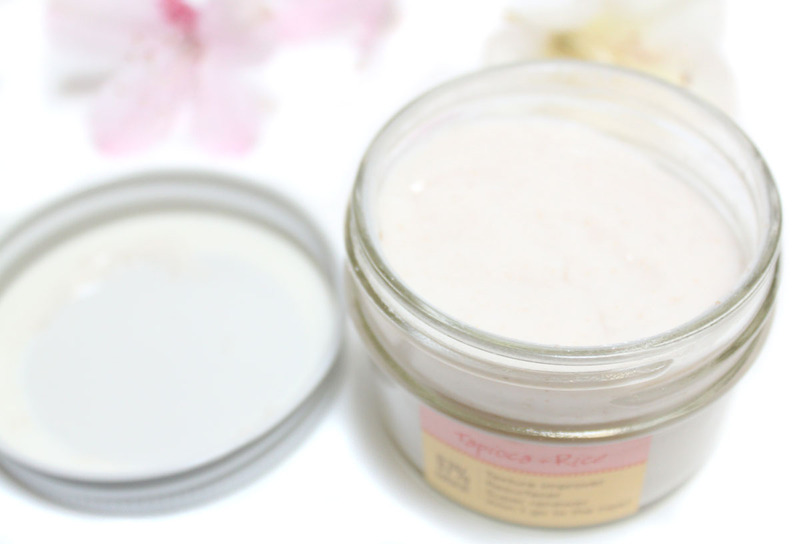 Pudding Apeel is a delcious dessert mask with a creamy texture and alluring smell. This seems to be a theme with all FarmHouse Fresh products. The light tapioca vanilla frosting scent is so inviting and it has a light tingling sensation to let you know it's working. The texture of this mask is even like Tapioca Pudding which is so cool. You only need a tiny dab to cover your whole face. What I really like about this peel is that it dries down pretty quickly to a light cream color so I can do this mask anytime without looking like a green monster. 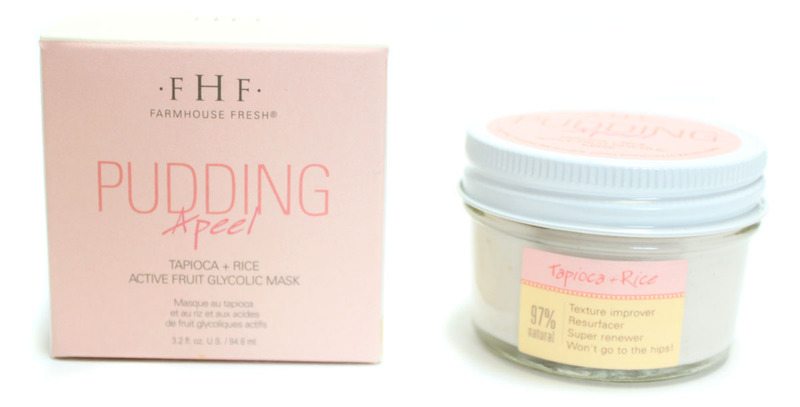 I love this mask for Summer when you need gentle exfoliation and to improve the texture of your skin. The AHA's slough away dead skin cells revealing younger looking skin. Over time it can help diminish acne and improve the appearance of sun-damage and aging skin. Pudding Apeel would be especially useful for those with sensitive skin who can not tolerate harsh peels or scrubs. After my first use I noticed a difference. The texture of my skin felt even, soft, and smooth. Best of all it doesn't require any abrasive products to get there. Just put on a delicious vanilla scented mask and chill. Exfoliating isn't always enjoyable, but with Pudding Apeel it's a real treat...and as they say and best of all...it won't go to the hips!